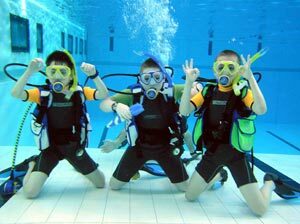 Scuba diving is a form of underwater diving sport in which a diver uses a Self Contained Underwater Breathing Apparatus (SCUBA) to breathe underwater. Certification: As with any other sport, scuba diving requires training and preparation. We have everything for a successful and enjoyable diving education: experienced and fun instructors, easily accessible pool and convenient local open water diving locations. The classes are available in English, Russian, Polish and Ukrainian languages and can be taken by both adults and children age 8 and older. We are using the most modern the curriculum from leading training agencies. After the course is successfully completed, students will receive scuba diving certification card. The card has no expiration date and accepted worldwide, so you can go diving anyplace you go. The card will also allow you to rent diving equipment and refill tanks in pretty much any dive center.